The Hellbender (Cryptobranchus alleganiensis) is a species of concern belonging in the species group "amphibians" and found in the following area(s): United States. Copyright Notice: This article is licensed under the GNU Free Documentation License. It uses material from the Wikipedia article "Hellbender Salamander". Glenn, C. R. 2006. "Earth's Endangered Creatures - Hellbender Facts" (Online) - Licensed article from Wikipedia: The Free Encyclopedia. Accessed 4/20/2019 at http://earthsendangered.com/profile.asp?sp=10257&ID=9. 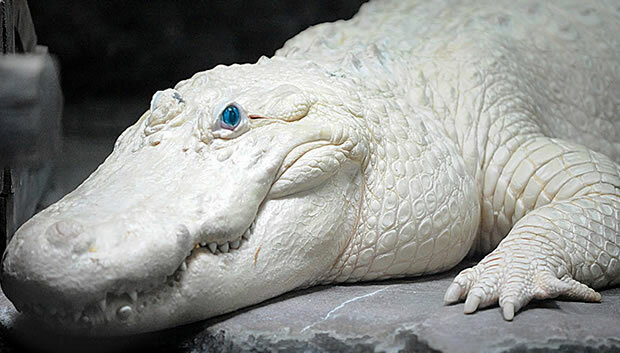 Creatures with albinism and leucism are beautiful and rare animals. They have all the characteristics of others of their species except they are white in color. The lack of melanin generally results in the animal looking bleached all over, appearing white or pink. It happens in many animals ranging from squirrels to whitetail deer. Here are ten incredible and rare, white-colored creatures that you'll probably never see in real life.